Where love and learning come together. Owner and Manager, Martina Crowley and her staff are dedicated to making their childcare and pre-school services a great success. Parents are encouraged to openly communicate with staff, so the children can benefit from the best environment possible. Built on WordPress, the website features a secure web cam system that only registered parents can view, so parents can check on their child at whatever time they need. There also descriptions of meals, the different childcare rooms and recent events. 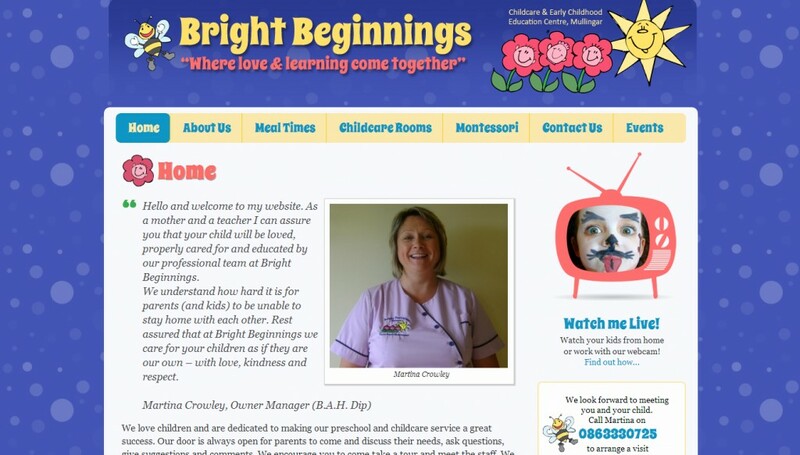 Any parent with young children in the Westmeath area should over to www.brightbeginningsmullingar.com and check it out.